Bring the family to celebrate with food, music, games and rides, and more. Purchase required for rides and games. Join us as we celebrate the history of Broad Ripple with a 4-day festival featuring activities for the entire family. The Broad Ripple Carnival is brought you by the BRVA and Event Title Sponsor State Farm – Elizabeth Marshall. The event features carnival rides and games, food and drink, a craft beer garden, live entertainment and community booths. A history exhibit provided by Broad Ripple Gazette will be on display and Saturday will feature an artisan flea market. All ages are invited to participate in the Carnival. It’s dog friendly too! Just please have your dog on a leash in the park at all times. We even have an obstacle course for them to enjoy provided by the Marion County 4H. An amusement park was built on the site of Broad Ripple Park in 1906. 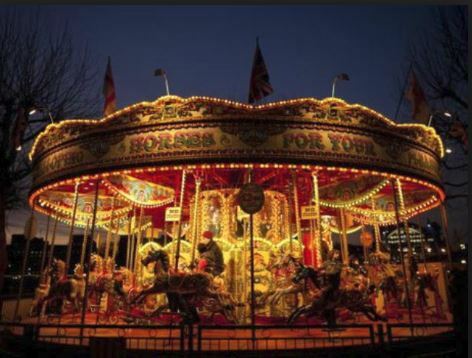 The carousel pictured once was in the park and is now at the Children’s Museum. Attend the Carnival to learn more about local history. No unauthorized/unlicensed vendors allowed. No unauthorized solicitations, campaigning, handbills, sampling, give-a-ways, sales, etc. If you have a question or are unsure about an item, please contact us. The carnival takes place in Broad Ripple Park located at 1500 Broad Ripple Avenue, a 61-acre facility managed by IndyParks. Event attendees are encouraged to walk or bike to the event. Broad Ripple Park is approximately .5 miles from the Monon Trail and Central Canal Towpath. IndyGo Route 17 services Broad Ripple Village and Broad Ripple Park, click here for their online trip planning service. Event attendees should park in the neighborhood surrounding the park. There is a limited number of spaces at Broad Ripple Park reserved for handicap patrons and users of the Dog Park and Family Center. All other vehicular traffic and parking is restricted. Sponsorships are available for this great local community event. Please consider supporting this four-day event for Broad Ripple Village. Request the list of sponsor benefits by contacting Broad Ripple Village Association, Kent Springer, at inkent56@gmail.com or (317) 946-1561. Event coordinators are looking for volunteers to help with the event. Volunteer shifts are only 2.5-3 hours and include such tasks as selling ride tickets and wristbands, monitoring the history exhibit, manning the info booth, and helping with set-up and tear-down. Sign up here at email the BRVA office at info@brva.org or (317) 251-2782. The celebration will feature food service daily; and an artisan flea market on Saturday. If you are interested in vending at the event, please contact Lisa Ripley. You are invited to meet the public and advertise your business at one of our Community Tables. We provide tables and chairs and you provide information about your business or non-profit organization. For-profit businesses may reserve a 3-hr time block for $100. Non-profit businesses may reserve a 3-hr time block for $50. For a reservation, please contact event chair, Elizabeth Marshall at elizabeth.marshall.quht@statefarm.com or (317) 531-9910. Organizations may share information, pass out flyers, host an interactive activity, etc. Tablecloths, banners, and signage welcomed!